Some time ago I did some work for Accuquilt designing a few things. We ended up parting ways but the patterns I designed and rights to them are all mine. I debated and debated what to do with the designs and then finally I decided to just give them away for free here on the blog. This is the second of four patterns that we’ll feature. If you don’t have an Accuquilt Cutter, don’t worry. I have rewritten the patterns so anyone can make them with or without a Go. Your snowflakes will be a little different but it will still work. This would also make a great Christmas Tree Skirt. The design consists of four blocks that are the same and one different center block. There are also 4 triangle pieces. If you are looking for a way to create snowflakes without having an Accuquilt cutter, you can try this method from my Making Learning Fun website that uses circles, hexagons, triangles and squares. 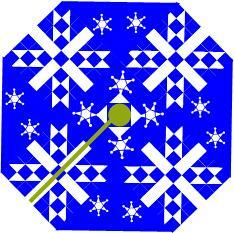 Here is a link to the Fluttering Flakes Centerpiece. This entry was posted in Finished Projects on October 18, 2013 by Jo. Adorable and thank you for sharing with all of us! 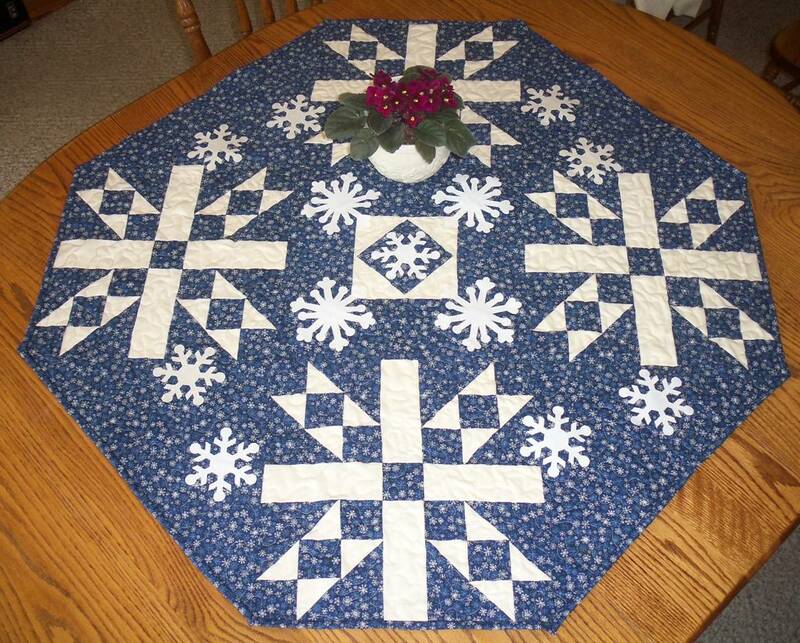 Love snowflakes and my Accuquilt Go. My wonderful son gave to me as a birthday present a couple of years ago. What a beautiful design. Thank you very much for sharing. I look forward to making it. This is so nice for you to share with us.. It will come back to you 10 fold!! Lovely. I like this almost as much as the one with the reindeer. You are a treasure. thanks so much for sharing with us! There is a special place in my heart for snowflakes, so this really captured my attention! Love it! Beautiful! Thank you so much for sharing your pattern. Fantastic table topper! Thanks so much for offering a free pdf pattern and instructions to make. Jo–how do I find your Reindeer quilt pattern????? THat is so pretty. I love the colors together!